The adjective you're searching for is "tender." From the first series of title cards through to every instagrammable frame of Luca Guadagnino's Call Me by Your Name it is the tenderness that remains pungent to each of the senses. While it may not always feel or seem as if there is a particular tenderness to the love story being told here-the film takes its sweet time introducing this inevitable aspect-there is always a tenderness to each of the characters as they exist in this bubble of eternal warmth brought on by the summer season and their escape to Northern Italy. Tenderness breathes through every ounce of Guadagnino's film whether he is highlighting the see-through indigo waters of the Ligurian Sea or the intimate brush of soft skin between two human beings. 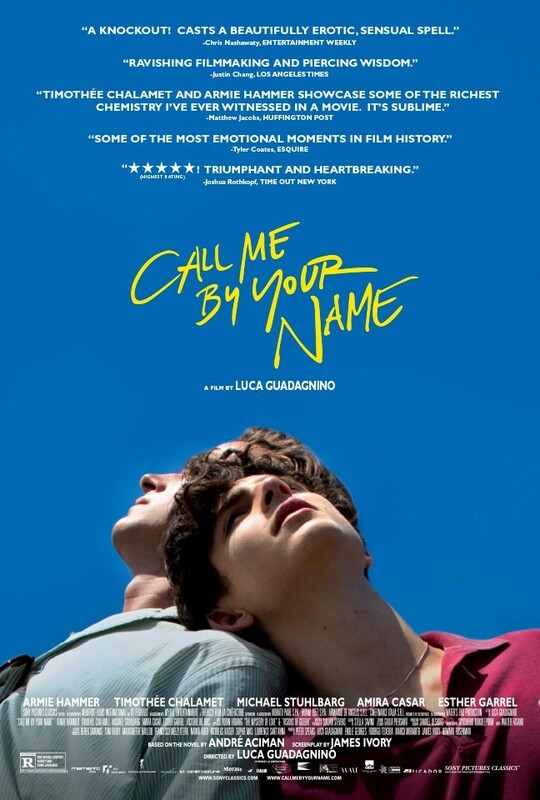 This consistently gentle, but still strikingly beautiful aesthetic paired with the large amounts of sympathy we, the viewers, continue to feel as we grow more and more involved in the story paints this overall portrait of seventeen year-old Elio (Timothée Chalamet) and his budding relationship with the visiting Oliver (Armie Hammer) in gentle motions of complete tenderness. Suffice to say, Call Me by Your Name is not simply a film about the coming of age of a young, gay male in the early eighties, but it is a complex character analysis of this young man who has been given every academic advantage, but still struggles to figure out who he is among his liberal Jewish family that has refined his cultured and delicate personality. Elio is a personality that is wholly understanding and forthright about the circumstances that have led to his upbringing and how such has shaped the person he presently is, but this level of perspective has also brought about a level of self-awareness that allows Elio to understand how little he understands about the more vital, emotional aspects of being. Though I've yet to see Guadagnino's 2009 breakout hit I Am Love I wasn't all too impressed with last year's A Bigger Splash as it was more a melodrama where the characters had nothing better to do than create their own drama while yearning to be of huge emotional resonance, but ultimately failing to do so because those characters brought so much of their strife upon themselves. With his latest, Guadagnino adapts André Aciman's novel from James Ivory's screenplay and transcends the intellectual bubble of privilege and emotional consumption by submitting itself entirely to the tender love story that is its essence. Oliver (Armie Hammer) listens in as Elio (Timothée Chalamet) plays variations of a single tune. It's the summer of 1983 in a villa in the North of Italy and seventeen year-old Elio is visiting the country as he always does with his parents, Professor Perlman (Michael Stuhlbarg) and mother Annella (Amira Casar) who is a translator and whose family owns the villa, where they have a doctoral student come every year and do an internship with Elio's father. This year it just so happens to be Oliver who looks like Hammer and is the epitome of what would have been the definition of "cool" in the early years of that now fondly remembered decade. 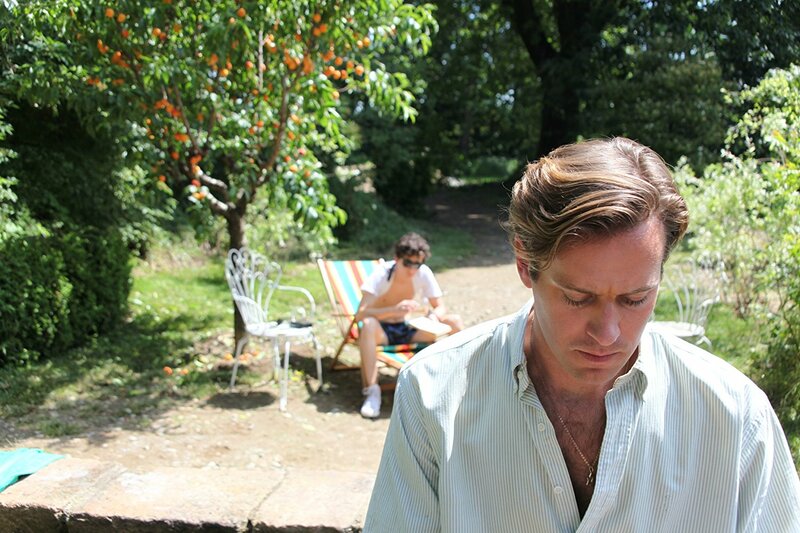 Initially though, Oliver represents everything that Elio seems to despise. Oliver is this cocky, hunky American who is self-assured and presumptive in the fact that everyone he encounters will naturally like him. Needless to say, they don't get along with one another despite Oliver's arrogance more or less feeling like a way in which to gauge where Elio falls in terms of his feelings. In what is maybe the most impressive move by Call Me by Your Name the film gives way to these dynamics and then allows them to soak into the spirit of the beautiful nature that surrounds these characters. Nature itself playing a crucial role in the film as well. There is a line, late in the movie that is included in one of Stuhlbarg's many magnificent performances this awards season where his character states that, "When you least expect it, nature has cunning ways of finding our weakest spot." Guadagnino explores this idea throughout his film, leading up to this moment, by visually highlighting the power of Mother Earth and how her beauty is suggestive to Elio and Oliver's true selves to a point they feel comfortable in allowing their impulses to come through; transforming them and the experience of that summer altogether. This is Guadagnino using every square inch of his frame to emphasize the feeling that comes into play in every room where scenes take place. There is such a looseness and casual tone to the characters and this environment that it's easy to give into the atmosphere and not recognize the calculative nature of every decision Guadagnino and his set/production designer are employing, but this is how it is supposed to work and it works near flawlessly. As Elio lounges around in hardly anything all the time, leaving the windows open, the air free to come in and out of the house as it pleases, and everyone riding their bikes as if they have no deadline on when or where they need to be-it is the euphoria of the environment that stands to be blamed for elevating such impulses to levels of romance that are undoubtedly doomed from the beginning and it is in this contradiction of feeling and of knowing that Call Me by Your Name finds its greatest tragedy. And though Call Me by Your Name is undoubtedly a love story in the most pure of ways it is also in these representations of both love and passion that the film finds its single greatest weakness. I know, that previous paragraph makes it sound like this film is one of pure escapism until it brings you back down to the real world to break your heart and it is, but within the execution of this love story there are not necessarily shortcomings, but more failures to communicate, at least to this viewer, what it is exactly that attracts these two to one another outside of their own physical attributes. It's true, I wish I felt more involved in what caused this relationship to spark between our two leads. Underplaying the romantic angle for the first hour or so is understandable. Neither Elio or Oliver are sure how one another feel, and Elio especially-being the audiences surrogate into the film-is still very much figuring out who he is, if he is gay even, but knows he has these impulses and desires that he can't seem to remove or place out of sight for the next six weeks or the remainder of Oliver's internship. Both young men even spark up relationships with local girls on the island as Oliver dances away the night (in what is a viscerally great scene) to The Psychedelic Furs, "Love My Way," (which, not coincidentally I imagine, has an opening lyric of, "There's an army on the dance floor.") and makes out with Chiara (Victoire Du Bois) as Elio sparks up a summer fling with Marzia (Esther Garrel) with whom he seemingly finds a sense of what is expected to be actual teenage love and lust. These actions, both in the context of their summer arcs and to the characters themselves, feel very much an act of defiance so as to try and confute what each may suspect of the other. And yet, they cannot help themselves and at an hour and a half into the movie (probably too long, but I digress) there is this first real sign of genuine affection for one another that comes to pass. As the film then develops, the attraction between the two comes to feel the more prevalent aspect of this relationship as conveyed by Guadagnino rather than that of the substantive aspect or the emotional foundation outside the attraction. Naturally, this speaks to the more primal state of the relationship, the "honeymoon phase" as it were, as this is what Elio and Oliver are essentially experiencing, but while we get many a scenes with the two of them that consist of short, but admittedly eloquent exchanges that then quickly resort to the tugging and pulling of one another until these interactions become wholly physical, it never feels as if we actually spend enough time with them. At one point in the film, Elio's mother is reading the sixteenth century romance, “The Heptaméron,” from Marguerite of Navarre that begs the question, “Is it better to speak or to die?” Elio inherently believes he would never have the courage to ask a questions such as that, but by the end of the film it seems clear Elio knows the better of the two. I just wish he'd spoken up a little more. Elio and Oliver develop an affection for one another in Call Me by Your Name that both are timid to test. There is a quick, single shot in Call Me by Your Name of a handyman propped up in the grass chuckling at these people going on and on about things so passionately on which they have no particular bearing that is both kind of fantastic and kind of how I felt for the first half hour or so while watching the film. Like A Bigger Splash, this is a movie about intellectuals laying around in the sweltering heat of their privilege and figuring out how to further their minds and then, in their down time, contemplating life further. Such academics are the people I've secretly always aspired to be like-seemingly knowing everything about everything, even the origins of the word apricot at an off the cuff moment-but know I could never, really become due to my own self-awareness and self-consciousness. For instance, Stuhlbarg and Hammer discuss ancient statues in their research as Stuhlbarg's Professor will describe these ancient relics and their ageless ambiguity, making it "as if they're daring you to desire them." It is a world I'm fascinated to watch from the outside in, but that my mentality doesn't always gel with due to the obvious differences in life experience thus far. And yet, it is a crucial element in the film for without these more forgiving circumstances this relationship and such comprehensions that come to both men throughout might never have received the right nurturing to allow this connection to come to fruition. Another crucial element that adds both to the sensuality and atmosphere of the film is that of the score and soundtrack. The score will pop up sporadically in a moment of unacknowledged intimacy, stopping as soon as one of the characters begins to speak, and then easing its way back in when it is clearly needed if still not for long. As the film goes on, one notices this sporadic nature less and less with the soundtrack becoming the component that offers more a sense of this environment and the space and time of this all too brief bubble that these events are forever contextualized by. The trio of Sufjan Stevens songs that feature lyrics, but ultimately serve more as a score to the film, transcend the aforementioned essence of the picture to pull out the already raw emotions of the performers and their characters that much further while selections such as the already noted Psychedelic Furs track and F.R. David's "Words" reiterate this specific setting that serves as the backdrop for these events. There is an interesting turn the film takes after Oliver and Elio consummate their relationship for the first time where Oliver is seemingly concerned about what he might have done to the psyche of this younger boy. Oliver even tells Elio at one point that, "he knows himself," that "they've been good," and that they have, "nothing to be ashamed of," at this point. It is in these moments where we come to swiftly understand the tragedy of their situation comes not in the form of some huge, melodramatic moment, but that it is more in the simplicity of this relationship never being one that was meant to last. In the delivery of this recognition and awareness that both Hammer and Chalamet excel. Both actors bleeding this sense of knowing; of understanding how rare and how special what they possess is. It is these two lead performances that allow Call Me by Your Name to feel as vital and as fleeting as the romance within it does. It is through these performances, as well as Stuhlbarg's final speech between he and Elio that the material isn't necessarily elevated, but that there becomes this depth in every other aspect of the filmmaking. Call Me by Your Name could easily communicate all of the ideas and themes it desired without any of the characters necessarily having to speak a word, but when they do it is all the more crushing in terms of the struggle that sadly is inherent to being queer in that silence typically goes hand in hand with as ensured a sense of survival as possible. The final sequence of events encapsulated by the changing climate outside and how they coincide with the changing of the seasons in Elio's life are downright heartbreaking. The final scene and collection of realizations outright destroying you. Chalamet's performance with it. With realism and true beauty, Guadagnino conveys a story some might still be uncomfortable with in honest terms that make this as much about the individual people as it does the relationships these people have.